ClydeUnion Pumps, an SPX Brand, had a good challenge – more orders than they could fulfill internally. So they turned to W. Soule to supplement their work. Our team completed 83 skids with a four day turnaround on each one. The end users are in the oil and gas industry. What does it mean to work at W. Soule speed? With over 125,000 square feet of climate-controlled production space we have room to move equipment, warehouse parts and completed skids awaiting pick-up, while still having space for the team to work. Piping is fabricated in-house and components are warehoused on-site too which helps keep effieiency high. The skids are being fabricated in the largest of our five shops, Soule Fabrication Group. It is located close to the highway which helps move parts in and finished pieces out faster. Our team includes pipefitters and millwrights. 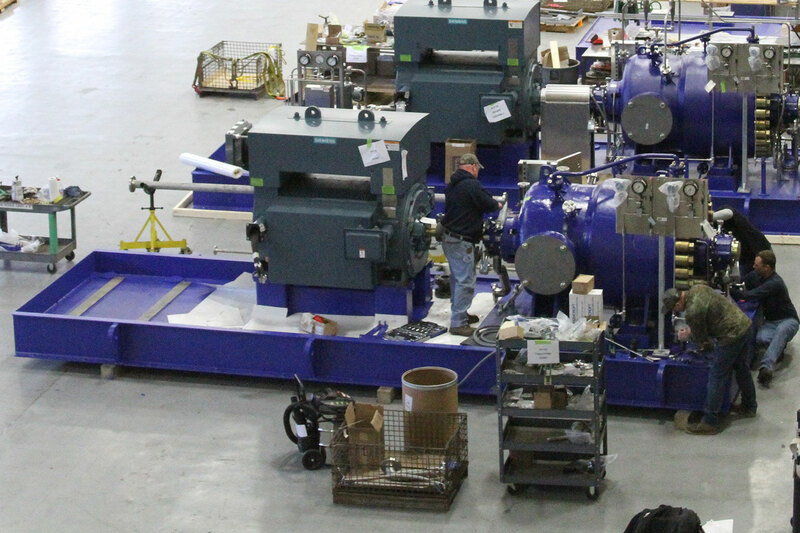 Pipefitters were preparing piping ahead of skid production and are available on-site to complete the piping on the skids. The millwright team was based at the same facility so the teams could keep the production flowing from one skid and skill set to the next. Client communication before, during and after the project is very important to us. Due to the scale and schedule of these projects, we hosted a representative from their team in our office and shop throughout the project so both parties had constant access to information. We also hosted daily conference calls and digital photos were shared throughout the project for a visual reference of progress. W. Soule’s craftsmens’ experience and diligent client communication by the project management team made it possible to meet this tight production schedule.